I first saw the drawings of this project and when later images of the nearly finished work appeared, you felt it straight away: this project was going to be world news. 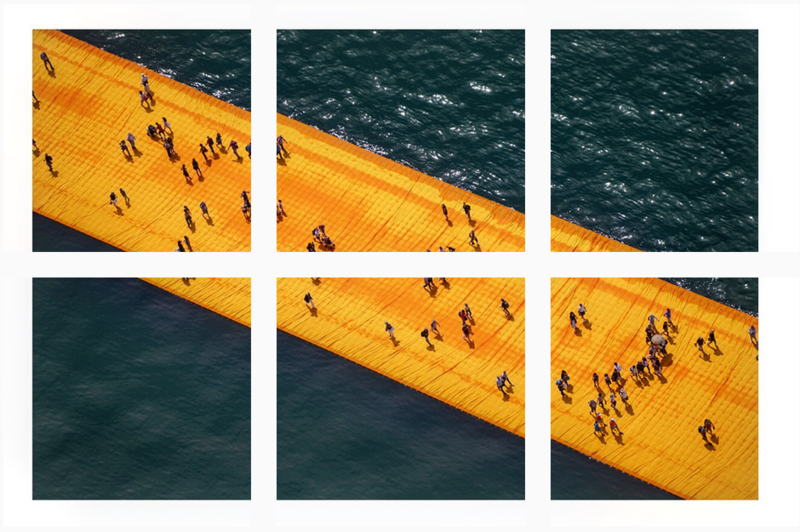 I’m talking about The Floating Piers, the astonishing temporary art installation of Bulgarian 81 year old artist Christo. The project consist of three saffron paths that link Monte Isola to the mainland, and a smaller island called San Paolo to Monte Isola. The Floating Piers parcours is 16 metres wide and 5.5 kilometres long. 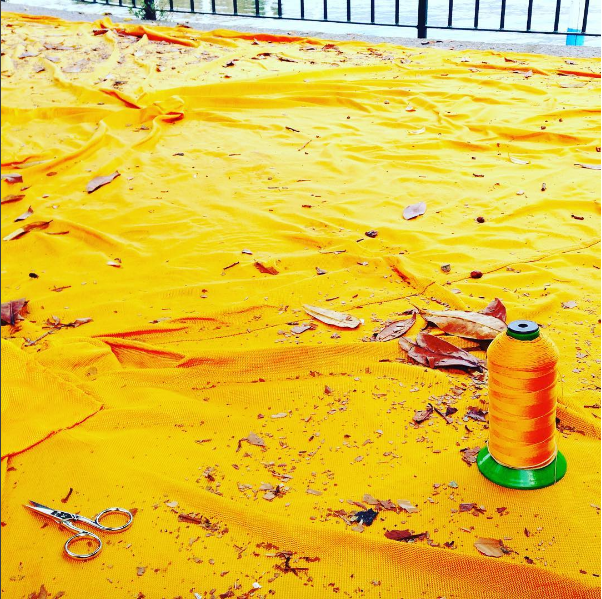 Technicaly it is a titan’s work: 100,000 square meters of shimmering yellow fabric, carried by a modular floating dock system of 220,000 high-density polyethylene cubes, undulate with the movement of the waves as The Floating Piers rise just above the surface of the water. Over the next 16 days, 40,000 visitors are expected to walk The Floating Piers. You can walk on the waters of Lakelseo until the 3rd of July. Although the floating piers installation is free and open to the public, the organisation cannot guarantee 24/7 access due to rain and strong winds. A team of lifeguards hands at all times to make sure no one slips into the lake by accident. 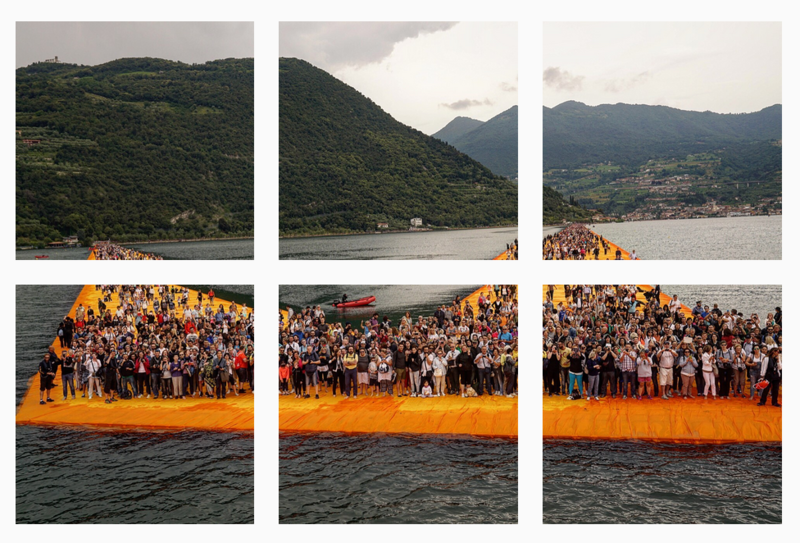 The Floating Piers was first conceived by Christo and his partner Jeanne-Claude together in 1970. It is Christo’s first large-scale project since Christo and Jeanne-Claude realized The Gates in 2005, and since Jeanne-Claude passed away in 2009. 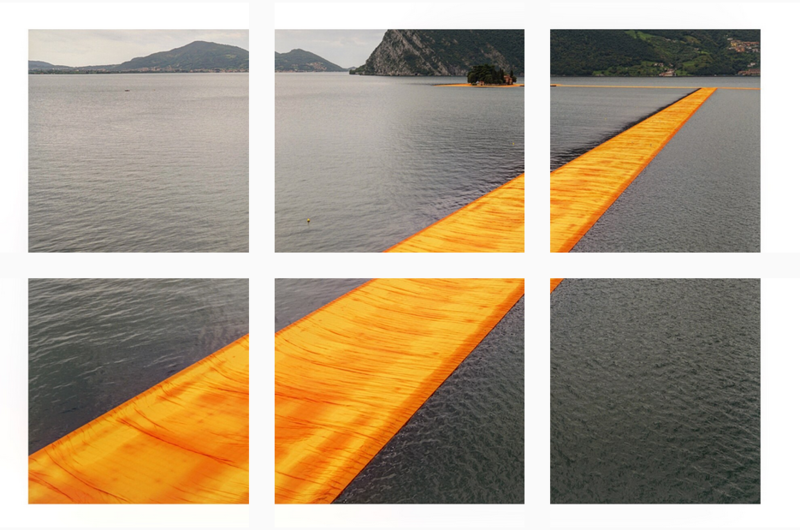 Christo specialises in audacious, large-scale projects that reinterpret landmarks and landscapes. With Jeanne-Claude he wrapped Berlin’s Reichstag with polypropylene fabric in 1995; in 2005 they erected 7,503 gates decorated with saffron-colored fabric in New York’s Central Park. As with all of Christo and Jeanne-Claude’s projects, The Floating Piers is funded entirely through the sale of Christo’s original works of art. After the 16-day exhibition, all components will be removed and industrially recycled. Unfortunately I could not visit the work myself. Some good friends travelled to Milan and Lakelseo to have a walk themselves. As expected, they were ecstatic and found the long trip so worth it. Jan Van Mol from Addict Creative Lab posted this image on Instagram, to show that due to the enormous mass of visitors, some reparations and stitches were needed. Nice ‘behind the scenes’ shot Jan!